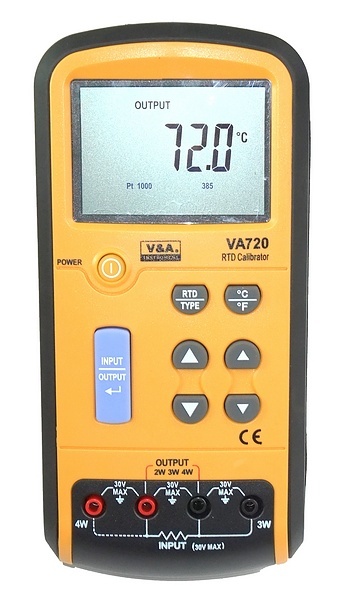 The VA720 RTD (Resistance Temperature Detector) Calibrator is designed for calibrating, measuring and simulating RTD instruments. 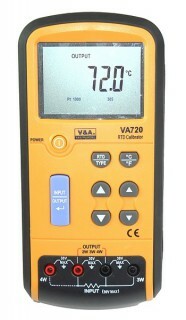 This temperature calibrator performs two functions. In Input Mode, it accurately measures the resistance produced by Pt100 resistance thermometer sensors and probes and displays them as a temperature. In Output Mode, you set the required temperature and it accurately generates its own signal to simulate resistance to an instrument (such as chart recorder, temperature controller, PLC, etc). 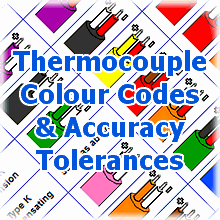 These functions make it a very useful tool for calibrating, checking accuracy or fault-finding temperature process equipment in many industrial applications. 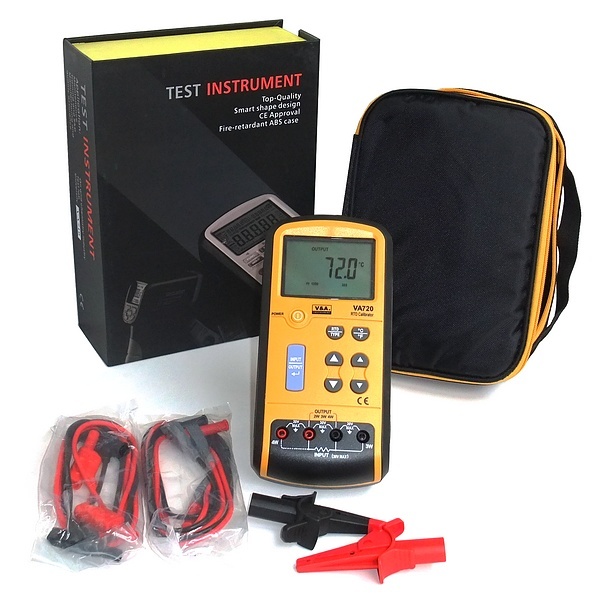 The calibrator measures using up to 4 wires and can measure in °C, °F or ohms. It measures 7 Types of RTD:- PT10, PT50, PT100, PT200, PT500, PT1000(385), PT100(JIS) in 4-wire, 3-wire and 2-wire configuration. UKAS (ISO 17025) calibration is optionally available. It is powered by 6 AAA batteries or can be mains powered with an optional AC adaptor. With over three decades of experience in thermal measurement solutions, we provide a comprehensive range of temperature related products and services for almost every type of industry. TMS Europe Ltd is a UKAS accredited calibration laboratory No. 0461, as defined in our Schedule Of Accreditation. The QR Code to the left can be scanned with a smart phone to visit this page.